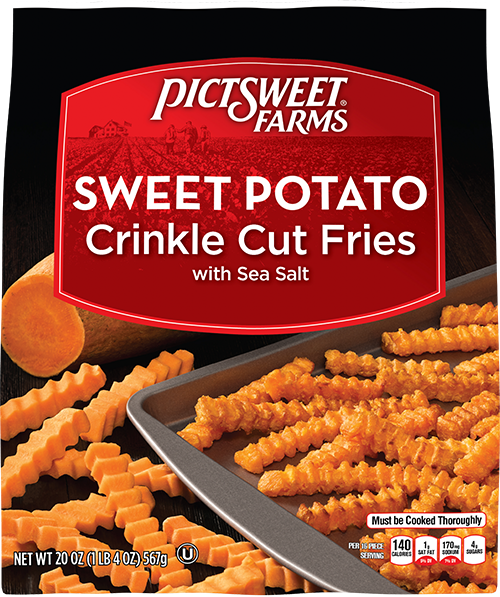 ​Experience the sweet taste and crunchy texture of Pictsweet Farms Sweet Potato Fries. We use only the highest quality sweet potatoes and season them with just a touch of sea salt. Also available in Straight and Waffle cuts – and try our Fusion Fries, a delicious blend of sweet and white potatoes. SPREAD frozen fries evenly on a baking pan. COOK 18 to 22 minutes or until desired crispness, turning halfway through. PREHEAT vegetable oil to 375°F. PLACE 1/2 package (10 oz.) frozen fries into basket and lower into hot oil. COOK 2 1/2 to 3 minutes or until desired crispness. Drain and serve. Sweet Potatoes, Soybean Oil, Modified Potato Starch, Rice Flour, Dextrin, Sea Salt, Leavening (Sodium Acid Pyrophosphate, Sodium Bicarbonate), Extractive of Paprika (Color), Xanthan Gum. CONTAINS SOY INGREDIENTS.